I am a physician, and have been a Hospitalist with the Southern California Permanente Medical Group at the San Diego Medical Center since 1990. I have been a photographer for much longer, since my late teens. My children laughed when they saw a photo of me from my teens, a camera in my hands. Currently all three of them are in college—at UC Berkeley, UCLA, and San Diego State University. The eldest seems to also have inherited the photography bug. 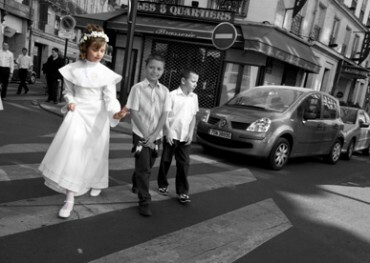 This photo was taken in Paris, near the Opéra. We saw children coming out of a church from their communion, and the girl glanced at a ring on her hand just as I took the photo. To emphasize her in her moment of joy, I changed the photo to black and white, but left her in color.